Apple’s annual Worldwide Developers Conference takes place in June this year At this conference the company unveils major platform updates for iOS and OS X, though in the past they have made several product announcements here as well. This year it is expected that Apple will reveal the 2013 Macbook lineup at WWDC. The new notebooks are expected to be available for shipping soon after they’re announced at the conference. 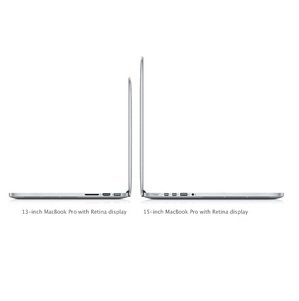 Apple’s 2013 Macbook lineup couldn’t come at a better time. In its recent financial results the company reveal that Mac shipments were up by approximately 10% while global PC sales have been declining partly due to the increase in popularity of tablets. The current generation Macbooks were released in Q3, 2012 and now it is high time for updated versions. Some recent surveys have declared that Retina Macbook Pro shipments have been declining because of the fact that these notebooks carry too high a price tag. It was rumoured that Apple is considering on dropping Retina display touting notebooks all together, however according to KGI Securities analyst Ming-Chi Kuo, the company won’t be making this move for now. They’ll continue to sell this particular Macbook Pro, because strong non-Retina sales compensate for the lacklustre sales of Retina Macbook Pro. He also adds that the 2013 Macbook lineup won’t bring the much rumoured Retina display Macbook Air. There might be a couple of reasons for this. First and foremost the Retina display will drive the cost up, and having already experimented with the high cost Pro model, this is something that Apple will look to avoid in one of its best selling notebooks. Furthermore, there seem to be production issues that are getting in the way of such a high resolution screen being installed inside a notebook as thin and as light as the Macbook Air. So what exactly will the 2013 Macbook lineup bring? Well, no substantial design changes for either the Pro and the Air have been rumoured up till now. It is possibly that Apple might reveal slightly updated versions of these notebooks, by simply bumping up the internal specs and pairing it with a brand new OS X platform update. The Apple Worldwide Developers Conference 2013 takes place on the 10th of June, hopefully the company will have more information for us there.